This is a mommy and me class. $60 mo. Ballet 1 Mon. and Fri. 6:30 PM - Ages 6-9 - $95 mo. Ballet 2	Mon 7:30 PM / Fri 5:15 PM Ages 10-13 $95 mo. Ballet 3 (Invitation Only) Mon/Wed/Fri 5:15 PM Ages 13-18 $125 mo. Beginning Jazz Tues 6:30 PM - Age 4-6 - $60 mo. Intermediate Jazz Tues 7:30 PM - Age 7-12 - $60 mo. Advanced Jazz Tues 5:15 PM - Age 13-18 -0 $60 mo. Advanced Lyrical Thurs 5:15 PM - Ages 13-18 $60 mo. 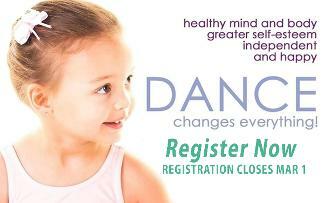 Intermediate Lyrical Thurs 6:30 PM - Ages 8-12 $60 mo. Hip Hop	Thurs 7:30 PM - Ages 8-18	$60 mo.